Sennheiser SP 20 ML is a premium portable speakerphones designed for mobile business professionals for both personal and small group conferences on PC/softphone and mobile phone or tablet. Built-in cable system connects directly to PC and mobile phone or tablet. Sennheiser HD sound quality and voice clarity provide better interaction. Lightweight, streamlined styling and superb finish give a high-quality appearance. Features include dual talk function, echo canceling, music setting and protective carrying pouch. With its streamlined styling and superb finish, the Sennheiser Speakerphone signals high-end quality wherever you choose to set up your office. No more searching for an available conference room. 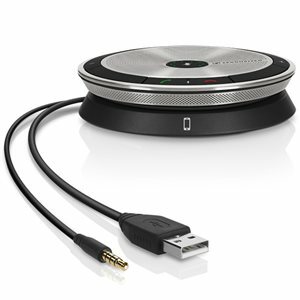 Set up an impromptu conference or share a call with high quality sound – in any room. SP 20 and SP 20 ML connect directly to PC/softphone and mobile phone or tablet. With the SP 20 variants you can merge PC/softphone and mobile calls into one conference, allowing you to add participants to the conference call via both PC/softphone and mobile phone at the same time. Replace PC and mobile phone speakers and microphone sound with legendary Sennheiser sound quality. Conference calls will never be the same. Sennheiser voice clarity, echo cancellation and dual talk function ensure a cleaner sound and a more natural speech and listening experience. Easy to use, clear microphone mute button, call and volume controls – plus practical and convenient cable management system. Give yourself a break between calls and use your discrete speakerphone to hear music when you want to relax. Replace PC and mobile phone speakers and microphone sound with legendary Sennheiser sound quality. Conference calls will never be the same. to operate with intuitive controasy use, clear microphone mute button, call and volume controls - plus practical and convenient cable management system. Give yourself a break between calls and use your discrete speakerphone to hear music when you want to relax. protection. Streamlined styling, superb finish and a lightweight, compact design signal high-end quality wherever you choose to set up your office.